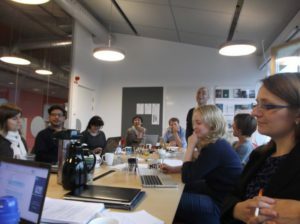 The Tensions of Europe Early Career Scholars’ Group is a self-organizing network gathering PhD-students, post-doctoral scholars and non-tenured academics within Tensions of Europe. 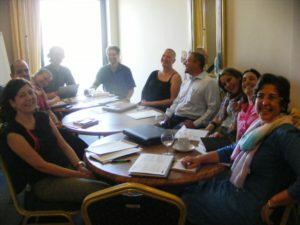 The group formed in Chios in October 2014 during the Tensions of Europe workshop “Quo Vadis?”, and contributed to discussing the future directions of the network. 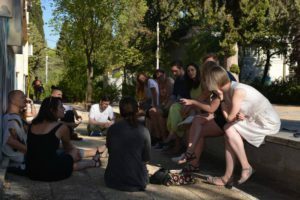 Since then, the group has developed into a support network with a dual aim: 1) to actively engage with debates within Tensions of Europe; 2) to facilitate and encourage community-building among early career scholars across borders. We provide an informal, open space for discussing research ideas and career development. Our main tool for doing so are regular meetings that take place both face-to-face and online, enabling participation for those who do not have the financial and/or practical opportunity to travel to meetings. Our meetings typically have an agenda based on the wishes and needs of the participants. We organize meetings around contributions in any form, not restricted to traditional paper presentations, but including brainstorming around research ideas, commenting on project proposals, draft articles and course syllabi, holding workshops on academic skills and strategies, etc. The group has organised 2 summer schools (Stockholm 2015 and Athens 2017), 2 semi-virtual workshops (Paris 2015 and Porto 2016) and 2 fully virtual meetings (one in January 2016 and one in January 2017). Members from the group also continuously organise conference panels within our fields. Workshop "Tensions of Europe--Quo Vadis" (Chios, Greece, October 2014). Tensions of Europe mini workshop (Paris, France, 27-28 January 2015). See program. Virtual workshop (January 18, 2016). See program. Workshop "Tensions of Europe/ICOHTEC Early Career Scholars" (Porto, Portugal, 1 August 2016). See program. Virtual workshop (January 10, 2017). See workshop notes.